Notes Designed by Melvin Johnson the M1941 was operated a short recoil and a ten round rotary magazine. It was developed alongside the M1941 light machine gun. 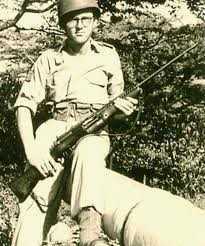 It was initially rejected by the US Army in favour of the M1 Garand but was adopted by the Dutch and a few were issued to KNIL forces fighting against the invading Japanese. After the fall of the Dutch East Indies some of the remaining rifles which were not yet delivered were quickly took over by the US Marine Corps as a stop-gap until their M1s were available in sufficient numbers. Many Johnsons were given to the Free French in 1942.